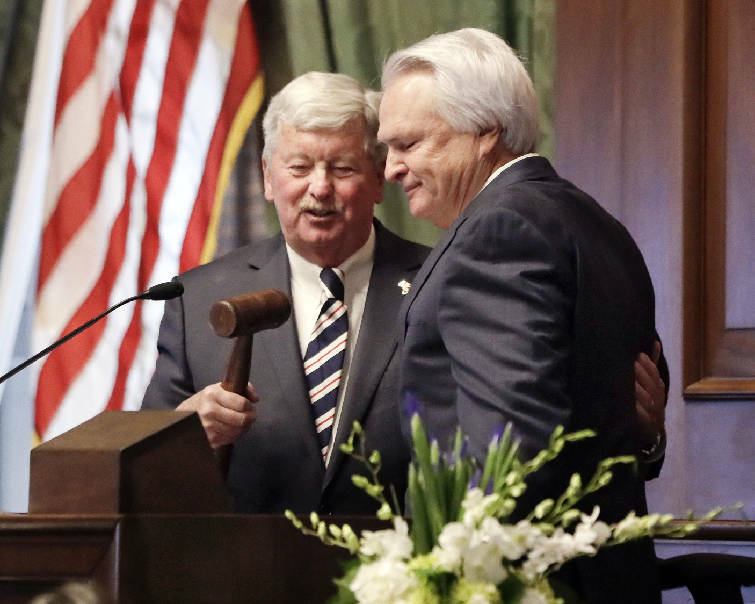 NASHVILLE — Newly elected Senate Speaker Randy McNally, R-Oak Ridge, pledged Tuesday to continue Tennessee's improvements to its financial footing, education and public safety as he took the gavel from retiring Speaker Ron Ramsey. "During the last decade, Tennessee has been blessed with outstanding political leadership," said McNally, a retired pharmacist and veteran Oak Ridge lawmaker, during a sometimes emotional proceeding as the GOP-controlled chamber voted to make him the second Republican since Reconstruction to lead the Senate. Tuesday was the first day of the 110th General Assembly. In the 99-member House, also controlled by Republicans, representatives voted unanimously to re-elect Speaker Beth Harwell, R-Nashville, to a fourth term as head of the lower chamber. In 2007, Ramsey, R-Blountville, became the first Senate Republican in modern times to become speaker when he bested long-serving Speaker John Wilder, a Democrat. In Tennessee, the Senate speaker is also lieutenant governor. With tears streaming down his face, Ramsey handed over his gavel to McNally and embraced him. McNally is just the third Tennessee Senate speaker since 1973. Twenty-seven Senate Republicans and two Democrats voted for McNally, who until Tuesday was Senate Finance Committee chairman. He was not challenged. McNally symbolically cast his vote in honor of Ramsey while three of the chamber's five Democrats abstained from voting. McNally told reporters later he was humbled by the experience. He praised Ramsey, who had supported him for the chamber's top post. "I think part of [Ramsey's success] is he sets some very good goals. And following those goals, making sure the state's fiscally strong, making sure that we have an abundance of jobs in Tennessee, making sure that education is able to provide our jobs for the future and making sure the public is safe, I think, are the main goals we'll follow." McNally acknowledged he and Ramsey, a loquacious auctioneer with an outsize personality and sometimes swaggering style, have different personalities. But, he said, "I know our goals are the same. I think I'll carry on in the Senate as I carried on with the [Finance] committee. [Ramsey] was one who gave a lot of freedom to his committee chairmen and to the people who served on committees. I think that will remain. I think that's important." Asked about Wilder's old saying that the "Senate is the Senate," McNally laughed, calling it an "old quote." "I think it's important, you know, we represent different areas and we represent different constituencies," he said. "But I think it's important that we come together and move the state ahead." That's "a lot harder to do than just kind of saying it," McNally added. "I think that's very important." When Ramsey announced last spring he would retire, a tough succession battle was looming among younger GOP senators until McNally, 72, emerged as a consensus choice. 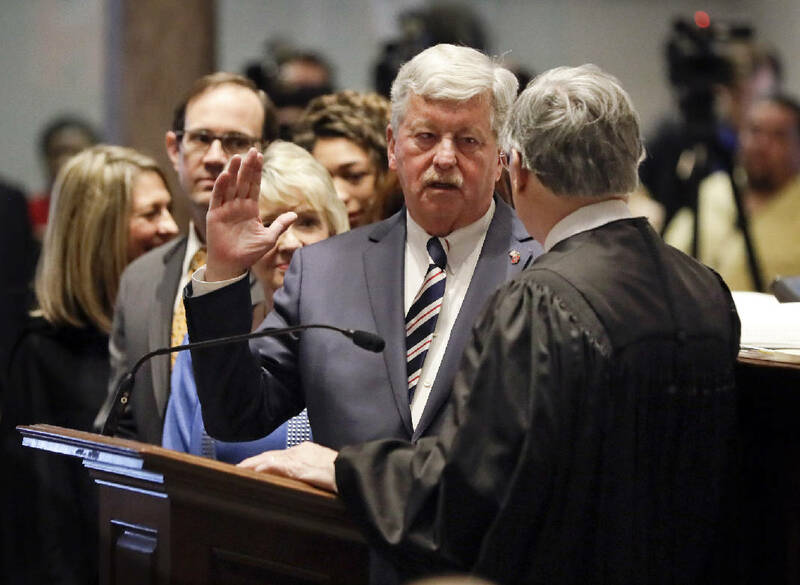 Among those lawmakers was Sen. Bo Watson, R-Hixson, first vice chairman of the Senate Finance Committee, speaker pro tempore and a close ally of Ramsey's. Watson said he predicted McNally was going to be a great speaker. "I look forward to his leadership. Obviously, his style will be different than Speaker Ramsey's. Different doesn't mean better or worse. It just means different." Watson said McNally has "that unique capability that few leaders have and that is he allows others to take credit for things that maybe he did most of the work on. And that is indicative of someone who is really confident in themselves and comfortable in their own skin." With Republican Gov. Bill Haslam expected to unveil a plan in coming days to raise gas and diesel taxes to fund Tennessee's continued progress in transportation, McNally said, "I think it's important that if it happens that gas and diesel are equalized." Probably the most important thing, McNally said, is "there should be a way to hold it revenue neutral, particularly during this time." While Tennessee transportation revenues are relatively flat and the state has a $6 billion backlog in previously approved projects, the state's general fund which pays for education, health care and most other functions of state government is booming. Harwell told reporters after her election that "we are waiting on the governor's proposal, and it will be fully debated and vetted in this chamber. This General Assembly does not take raising taxes lightly, so I predict that if we look at increasing the user tax on gas, we will also look at lowering a tax somewhere else. "We have a reputation of lowering taxes, and I think that will be the case again this year," Harwell said. The 110th General Assembly today will include a joint House and Senate convention to re-elect Secretary of State Tre Hargett, Treasurer David Lillard and Comptroller Justin Wilson to new terms. All three are Republicans.